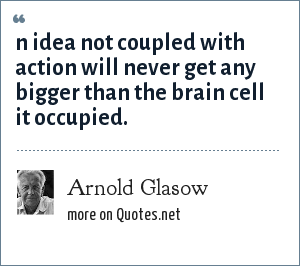 Arnold Glasow: n idea not coupled with action will never get any bigger than the brain cell it occupied. n idea not coupled with action will never get any bigger than the brain cell it occupied. "Arnold Glasow Quotes." Quotes.net. STANDS4 LLC, 2019. Web. 25 Apr. 2019. <https://www.quotes.net/quote/64576>.